TODAY is your chance to help those who help keep you safe. King County Search Dog teams train over 5,000 hours a year to be ready to help find lost or injured hikers and alzheimer’s patients. KCSD is an all-volunteer 501(c)3 non-profit that depends on financial support from the community it serves. 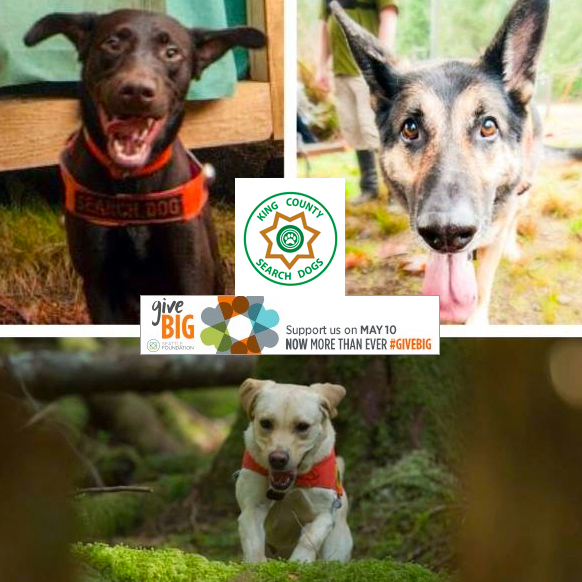 YOU CAN HELP by joining with the Seattle Foundation on its annual ‘Give Big’ day and making a tax-deductable donation to King County Search Dogs. It is easy to give to KCSD and many other King County charities on the Give Big website. Your employer may even match your gifts so that your generosity will have an even bigger impact. Please consider helping King County Search dogs today!